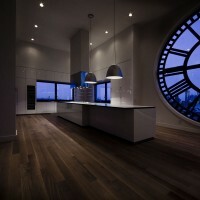 Minimal have sent us images of a modern kitchen they designed for a project in the Clock Tower building in New York. 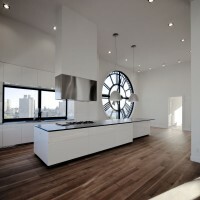 In 2009 MINIMAL USA designed a sleek, sophisticated kitchen for the renovation of the Clock Tower, the most expensive apartment in Brooklyn. 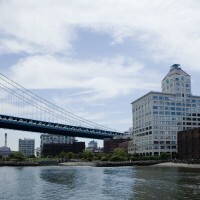 The Clock Tower, erected in 1915 on the DUMBO waterfront, is on top of one of the largest poured concrete building in New York. What used to be a machine room for the clocks is now housing a 6,500-square-foot apartment boasting a breath-taking quadrangular view of NY. The kitchen, designed by Stefano Venier for a renovation by developer David Walentas, embodies all the style and charm of Italian ingenuity. Glam is the system that was chosen among other kitchen collections by MINIMALUSA founders Bartolomeo Bellati and Stefano Venier and employs environmentally conscious materials imported from Italy. The cabinetry edges, as well as the refrigerator door, the wine cooler and the upper cabinets are mitered at 45-degree angles with all side panels, creating flat planes and clean lines. The cabinets are finished with ten coats of white F4star environmentally certified lacquer. The stainless-steel drawers hold over 100 pounds and have soft-closing mechanisms. The countertop and the two integrated sinks under the windows are stainless steel. The island is topped with the distinctive, grey 45-degree edged Pietra Cardosa Italian stone. 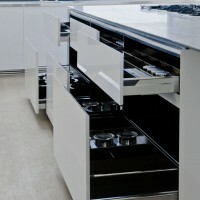 In line with Italian Design, the cooktops are built into the countertop with separate swing-door ovens installed below. The fridge, wine cooler, dishwashers, cooktops and ovens are all made by Gaggenau, the world`s finest appliance manufacturer. As for the rest, the steel grill kickplates, requested by the client, prove the high level of customization offered MINIMAL: they wrap the base of the island and outer perimeter of the kitchen and serve as air conditioning vents. 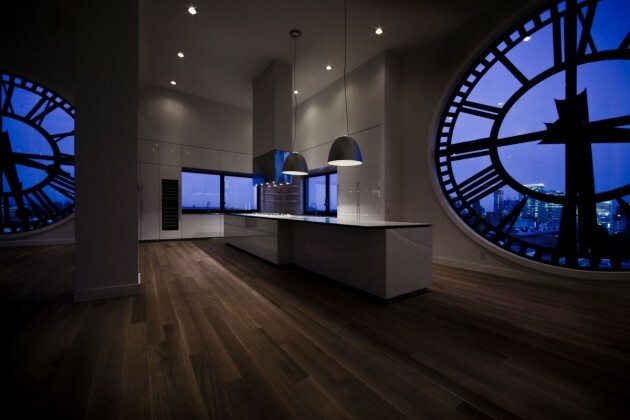 The counter serves simultaneously as supporting surface, food preparation table, cooking space and especially as gathering area: standing next to the island, it is possible to dominate the Manhattan vista through the glass clocks surrounding the bright room. With Italian sense of aesthetics, the kitchen has been conceived both to perfectly suit a dream domus and to create a winning combination with the atmosphere of the four Clocks. A provocative infusion where the kitchen stems out as a full-relief sculpture in the middle of an enviable $25M apartment. Visit the Minimal website – here.